Family Withdrew CBI Probe Appeal filed to Court: self-immolation case, son! A new turn has arrived in the matter of Shahjahanpur journalist death. Rahul Singh, son of Jagendra Singh, disclosed about the death that his father had self-immolated. The family has withdrawn the CBI probe 'writ petition' appeal filed to the court. 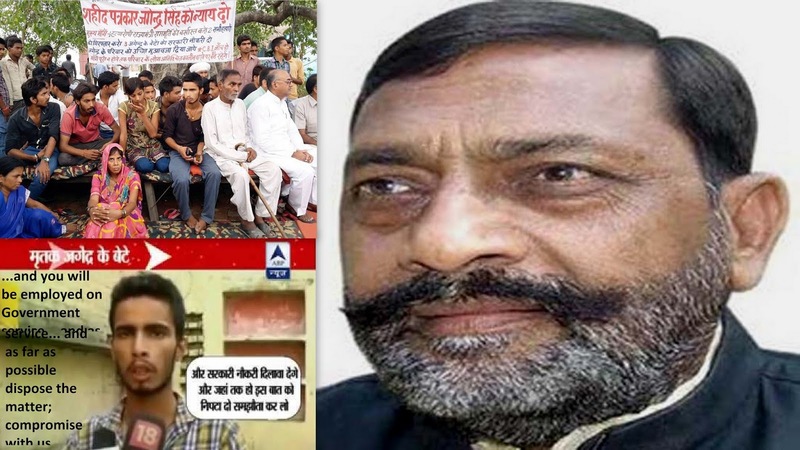 There were the allegations in the case on the UP state minister Ram Murti Verma. According to information, Jagendra Singh self-immolated with petrol splashed bath to avoid his arrest from police on June 1st, 2015. After that he alleged about the state minister, including inspector and the others, set him on fire. The next kin of Jagendra began demonstration and Dharna; as ex-gratia Rs.50 lakh and the government service were demanded: the state government compensated Rs.30 lakh for filling the family’s indemnity, and assured to provide the government services to Jagendra’s sons. Now the question is why did the family suppress the truth if they were aware about the committed suicide? However the CBI probe demand writ has been withdrawn.